Optical Handlers – eeyee is an optical device that dissects embodied visual experience with a simple tool set: LCDs and cameras. It literally splits users’ vision into two and relocates it onto their hands separately. The extended vision, along with the mobility of the hands, makes it possible for users to observe the world from a different perspective: through the limbs. Instead of splitting vision into just left and right, eeyee treats each split stereoscopically, so users experience a double mobile real-time stereoscopic vision, which has a redundant reality that raises an interesting question: “Aren’t we living in a 3D world already? When users wear this device, their experience is completely alienated. They have to manipulate their bodies and invent new ways to cope with their surroundings. 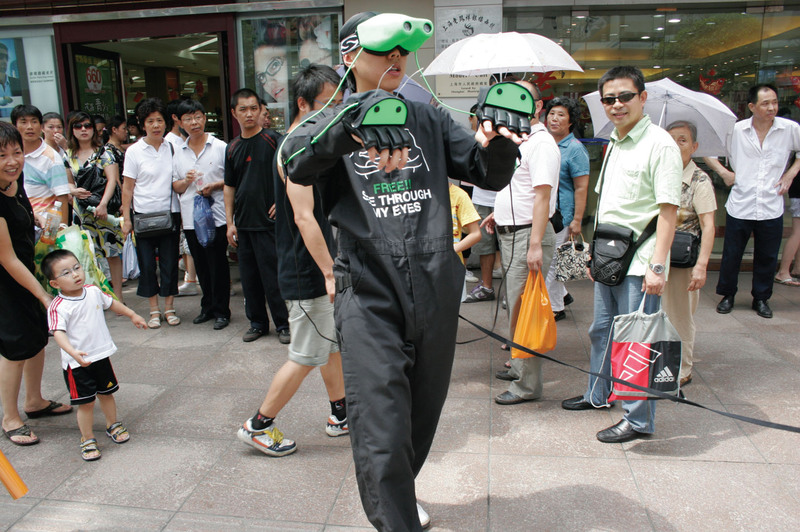 Two peeking holes in the face of the goggles allow bystanders to see what eeyee is looking at. As eeyee awkwardly moves around and learns about its environment, it draws a tremendous amount of attention and curiosity. Eventually, it bursts the social bubble with its friendly and funny alien look. Once someone is encouraged to come closer and peek into eeyee’s eyes, laughter follows. Essentially, eeyee blinds the users and heightens their senses to create a tension between the user and other human beings.